I finally made it to the Metropolitan Museum of Art. I’ve been living in Princeton for three years now but the last time I’d visited The Met was way back in 2002. While that was so long ago that it doesn’t really count in terms of being familiar with the museum, I decided that this time I’d start off and hit the sections that I wasn’t able to get to last time. Given that the day I visited was super busy, this turned out to be a decent strategy. I had previously only really seen the European and American galleries and ran out of time before I got to the Asian and Africa/America/Polynesia galleries. The day I visited? Europe and the Americas were packed. Too crowded to really see anything. Too loud to really think. Non-western though? Practically empty. I could wander at my own pace and think about things. 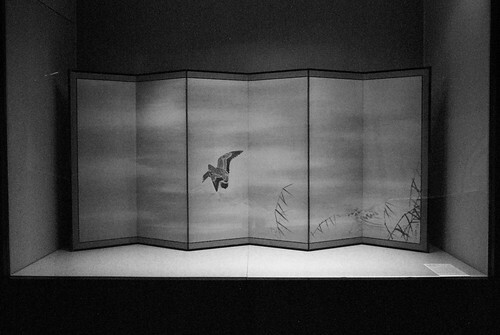 The Asian galleries are nice. 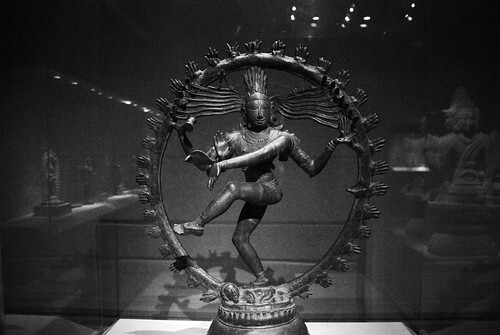 They actually do tend to talk about the objects both from an art history point of view and a functional use point of view—such as the Vishnu Masks which describe how the masks were used in performance as well as the history of those performances over centuries. Unfortunately, the way they treat modern art results in them committing one of my pet peeves. The galleries aren’t in the basement but they consistently other the modern artists. Noguchi isn’t a multiracial American artist, he’s a Shōwa Period Japanese craftsman. Inoue Yūichi goes into the same bucket even though his work explicitly references Franz Kline. And things get even weirder when you get into “Heisei Period” work like Kohei Nawa’s which more contemporary than most of the work in the Modern Art galleries. On the topic of The Basement, The Met also groups Africa, The (indigenous) Americas, and Polynesia are all together as, effectively, native craft. While there are a decent amount of old artifacts here, there are also many which are not only new, but actually—such as the Papua New Guinea Ceiling—commissioned by the museum. 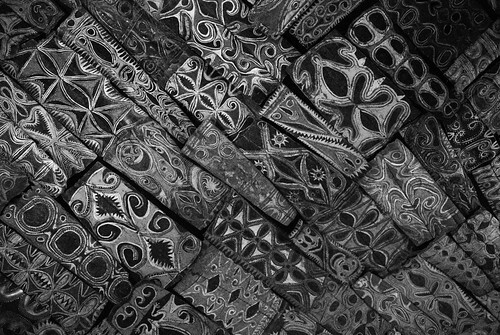 When the traditional crafts become detached from their traditional uses and instead are created for export and tailored to western tastes, we’re in an area where the museum needs to flag how the resulting artifact is a product of multiple cultures. * If the museum itself is commissioning pieces, I’d love to read more about how that transaction works and how the resulting art differs from the traditional form. *Something that the National Museum of the American Indian does a good job of in its permanent exhibition. Not only does it talk about the influence of “the market” but it goes out of its way to name the artists and talk about how they were able to become collectible. 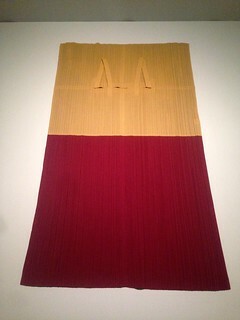 The indigenous galleries also treat modern art the same way the Asian galleries do. In this case for example, El Anatsui is only in conversation with Africa and, while these galleries are right next door to the Modern Art galleries, the hallway is not the only thing that separates them. I did venture into the crowds to check out the Manus × Machina show. As the current headliner these galleries were super crowded and a pain to navigate. Fashion shows are often a mixed bag. They’re designed to bring in massive crowds and in doing so often fail as educational opportunities. Fashion in particular tends toward the pretty or the trendy and while there is often a lot of function or process involved, that information is ignored unless it can be used to explain why something is so expensive. This show though is all about how the dresses were made. In particular the interplay between hand-made processes and machine-made processes on the bleeding edge of clothing design. It puts mid-century fashion in conversation with contemporary fashion and breaks everything down by process—pleating, lacework, etc.—so we can both compare the hand-made with machine-made versions as well as see how the use of the machines has allowed for even more fantastic creations. 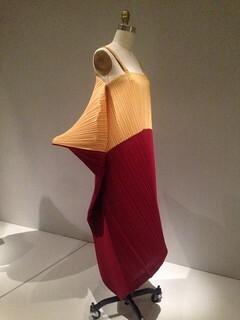 I particularly enjoyed the Issey Miyake designs on display as they demonstrated what technology allows while also playing with the way that clothes transform when worn. That Miyake’s designs are so different when “flat” versus when they’re on a model is a level of interest that isn’t present in most fashion shows. There’s also an unexpected amount of actual use going on. In high fashion like this, often the only real use is on the runway. These aren’t practical garments. At the same time, that some of these—notably the Hussein Chalayan dresses—are intended to move on their own or change the way the wearer moves is a level which I’m not expecting in most fashion shows. To the photography. The Met didn’t have much on display. One small exhibition which will be a distinct post and a few alcoves in a hallway. Two displays did catch my eye though. 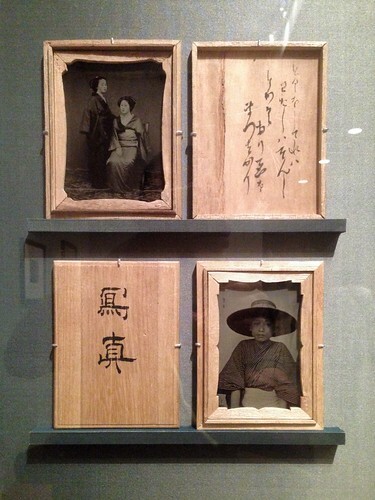 The first was a pair of Japanese ambrotypes* where I was struck by how differently they were displayed. I’m used to seeing ambrotypes and tintypes in small folding metal frames. Seeing them in little wooden boxes was a nice change of pace. While I wonder how well the wood and the ambrotype interact archival-wise, I think I prefer the way this method looks. The other thing that caught my eye was a solitary Becher print. I’ve never seen one by itself. I’ve never even considered that they could be displayed by themselves. I mean, it’s nice enough but the entire point is the typology grid where you can see everything and start to notice the ridiculousness of both the form and the way each one does its own thing. 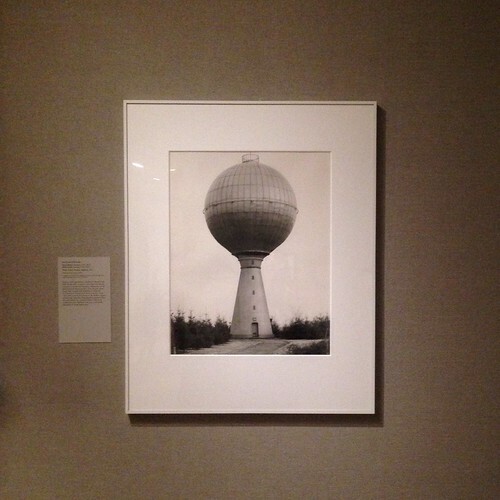 Anyway, the more I think about that solitary Becher the more I wonder about encyclopedic museums like The Met. They’re great at what they are—both as art primers as well as a place to go if you can’t travel. But I find them frustrating now. Too broad and, as a result, too conservative. The Met shows the world the way we saw it decades ago. When Asia was far away and different rather than where we call for tech support and manufacture everything. Where we could lump everything “3rd-world” into one set of galleries and visit those in a “safe” environment. 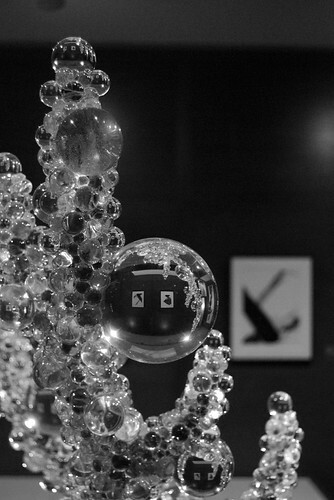 Where a small sampler of modern art and photography suffices for everything which we’ve created in the past century. I can’t help but feel that everything there is essentially a solitary Becher, stripped of context, a big name to check off the “must see” list. Where I get the most excited is in The Met’s print and ephemera collection. This is partly due to me being a print enthusiast but it’s also a massive collection of works which, while requiring artists to produce, is rarely thought of as art. It’s in these printed items though that most of us interact with and experience art now. We just don’t think of these things that way. 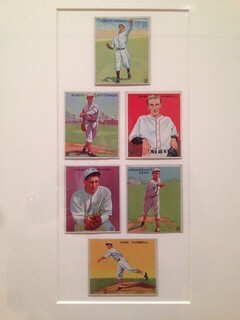 The Burdick Collection in particular is wonderful even though very little of it is on display. 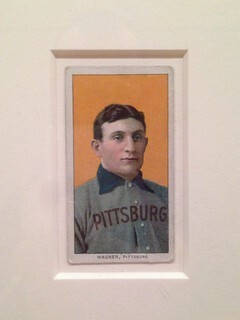 * There’s a small gallery of baseball cards in the backwaters of the mezzanine level of the American Art wing. I was able to spend a long time there by myself as the only people who came near me were completely lost and trying to find either stairs or a bathroom. ** And there were a few tables of post cards in the print and design room. But it’s a massive collection of printed material from the first half of the 20th century, most of which would be some of the coolest things to ever come across in an antique shop or your grandparents’ attic. *And there’s not even a catalog to purchase. **Both are admittedly difficult to find. I’d love to see The Met do more with these. As much of our print culture has switched to the digital space and redefined what we think of as ephemeral media, there’s a huge opportunity to look at the printed material from the last century in new ways from expanding on the existing history of centuries of printed material to looking at how printed material and images and ideas as cultural currency. This entry was posted in collecting, Metropolitan Museum of Art, photography, race and privilege, review. Bookmark the permalink.